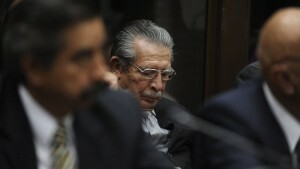 The long awaited trial of General Efraín Ríos Montt begins today, March 19, 2012. The brutal Guatemalan dictator will be the first head of state to be tried for genocide in genuine proceedings in his own country’s justice system. Ríos Montt and another ex-General, José Mauricio Rodríguez Sánchez, are going to trial on charges of genocide and crimes against humanity for massacres committed against nearly 2000 Maya-Ixil civilians during a brutal scorched-earth military campaign conducted in 1982. Justice will be a key step in ending impunity for the atrocities committed during the war. Your voice can make a difference! Click here to send an email calling on U.S. Ambassador to Guatemala Arnold Chacon to attend the genocide trial and demonstrate the U.S. commitment to ending impunity. It’s the least we can do. Write now to Amabassador Chacon! WANT TO KNOW MORE? WATCH OUR FILMS THAT TELL THE STORIES BEHIND THE TRIAL. Skylight will be filming the trial starting today (thanks to generous and timely support from the Bertha Foundation) and posting periodic videoclips on our Journal and the Granito Facebook page. Read the New York Times article that gives background on the trial and makes reference to Skylight’s 1982 interviewwith Ríos Montt that is being used as evidence in the case. Visit the archive of memories about the Guatemalan armed conflict, Granito: Every Memory Matters. The memories housed here make it impossible to shroud the past in silence. Please visit, learn, comment, and share.